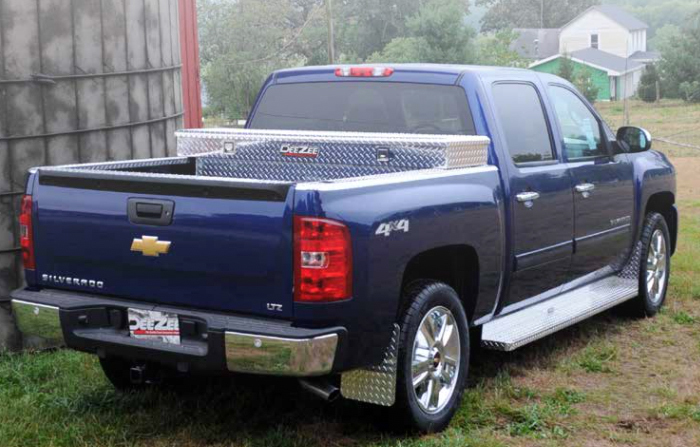 If you’re in the market for running boards or step bars for your truck or SUV, you’ve come to the right place. For almost 30 years, Precision Audio has been quietly serving our clients with the best-quality products and services. Many people like the fact that their truck or SUV sits higher off the ground, giving them a commanding view of the road ahead. The downside to sitting up higher is that it can be more difficult to get into the vehicle. If you or one of your loved ones find it hard to get into your vehicle, we can help. Maybe you’re the kind of person who wants to outfit your vehicle with a nice set of running boards to give it a classy look. If you have a vehicle that you want to look tough and rugged, ready for any adventure that lies ahead, a good set of step bars may be just the ticket. Here are some of our most popular products. Running boards are where it all started. In the beginning, they were made of fiberglass and were painted to match the vehicle, or made of diamond-plated aluminum for your work truck. Times sure have changed. Nowadays, modern running boards have a sleek, classy look. Many of the popular styles start out flush against the body, right behind the front tires, and flow out to give you a secure place to rest your foot. In front of the rear tires, they will mold back in, flush against the body. You will find them in black, stainless, a combination of both or even painted to match the vehicle. 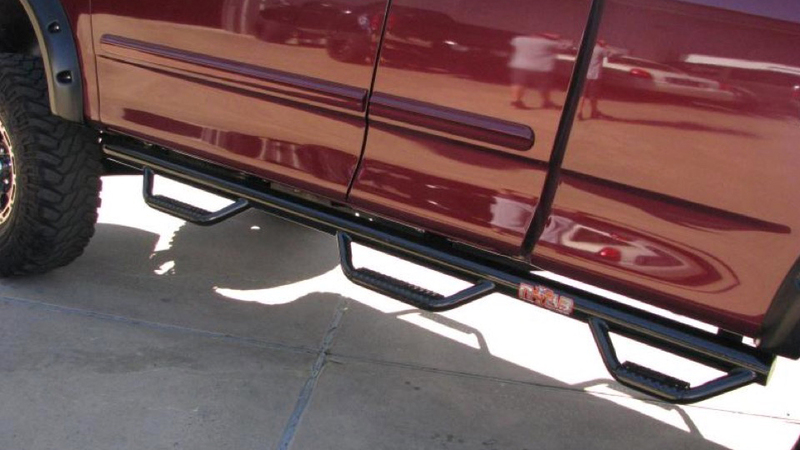 If you own an SUV and you’re going for the classy, subtle look, this step is extremely popular. 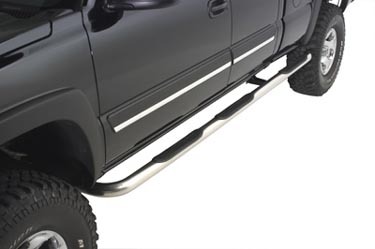 If you like the look of the classic aluminum running boards, and you need something that can handle the abuse given to a commercial vehicle, those are still available for many of the popular pickup trucks. Step bars are the driving force in the business today. It started with nerf bars more than 20 years ago. These are tubular steps made of metal, with the popular finishes being black and polished stainless steel. In the earlier years, these steps were made of 3” diameter tubing, but nowadays they come in several styles. You can get round, oval or square tubing in different sizes and shapes to suit your unique style, and these steps can go the length of the cab or from wheel well to wheel well. Several years ago, N-Fab patented a unique style of step bars. They combine the look of a nerf bar with an integrated, hoop-style step built into them. The most popular finish in textured black, but they do come in stainless for some applications. This is surely a rugged-looking and well-made product that many off-roaders prefer. The tube is mounted close to the rocker panel of the vehicle, making the hoop step the centerpiece of the design. You can get them in cab-length or wheel-to-wheel designs, and one of the coolest models has a step right in front of the rear tires, allowing for easy bed access. Power steps represent a hybrid design that is continuing to grow in popularity. 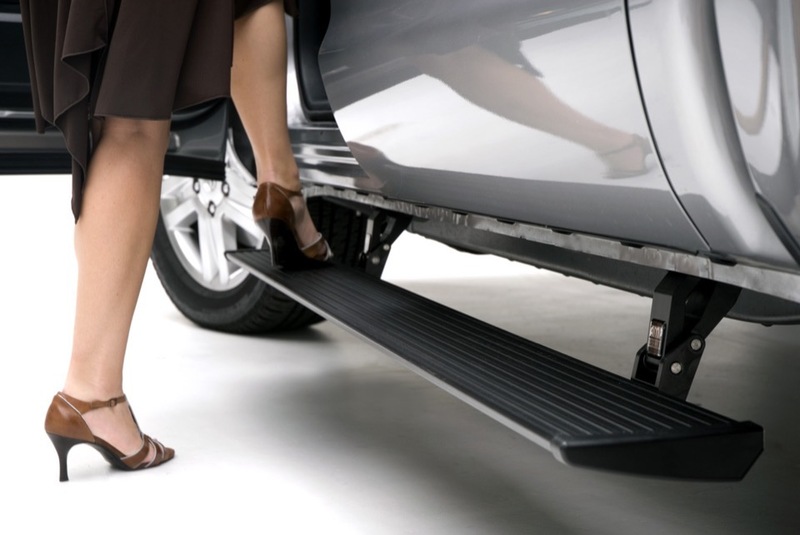 If you love the usefulness of running boards but don’t like the look, these steps are for you. If you want the ultimate in versatility and usefulness, you really need to give these steps a look. Here is how they work: When you aren’t using the steps, they retract up tight against the rocker panels, almost disappearing. When you open any of the doors, the steps motorize down in less than a second, quickly giving you a wide, secure place to rest your foot. The standard models drop down 6 inches, and the new XL models drop down an amazing 10 inches, making vehicle entry a breeze. Even if you own a lifted truck, entry is no longer a problem. When you close the last door, the steps retract up into their hidden position after a few seconds. The finishing touch to these steps is their integrated LED lighting. When you open the doors, the lights turn on and illuminate the steps and the ground below, making ingress and egress that much safer. And what good is a great set of steps or boards unless it’s installed properly? Precision Audio employs highly skilled and expertly trained technicians who will treat your vehicle with the utmost care. We will never cut corners when working on your vehicle. We invite you to stop by our facility with your vehicle and let us show you all the different options we have for you. When we work with you, we promise to give you our undivided attention and help you find the best solution for your unique needs.